In East London, at Royal Victoria Docks, there is a place which holds stand up paddleboarding (SUP), wakeboarding and SUP yoga sessions. 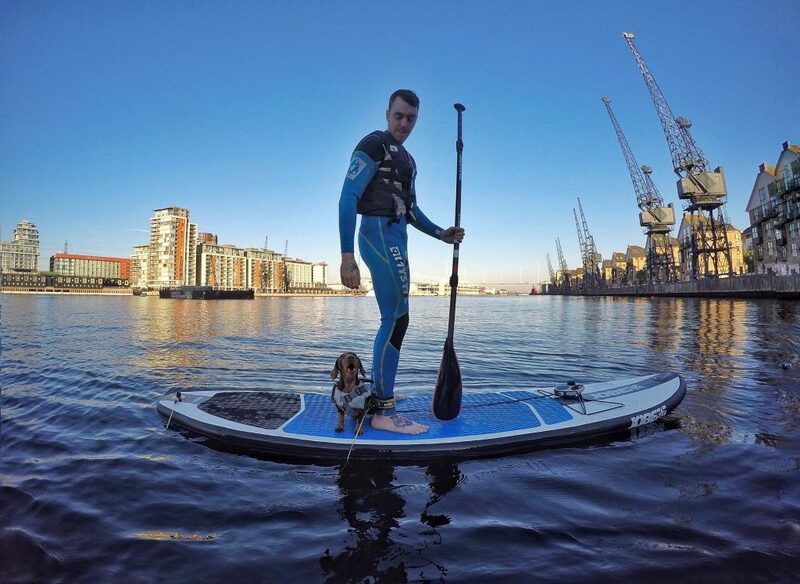 It is called Wakeup Docklands and great news is that there you can experience dog-friendly paddle boarding. 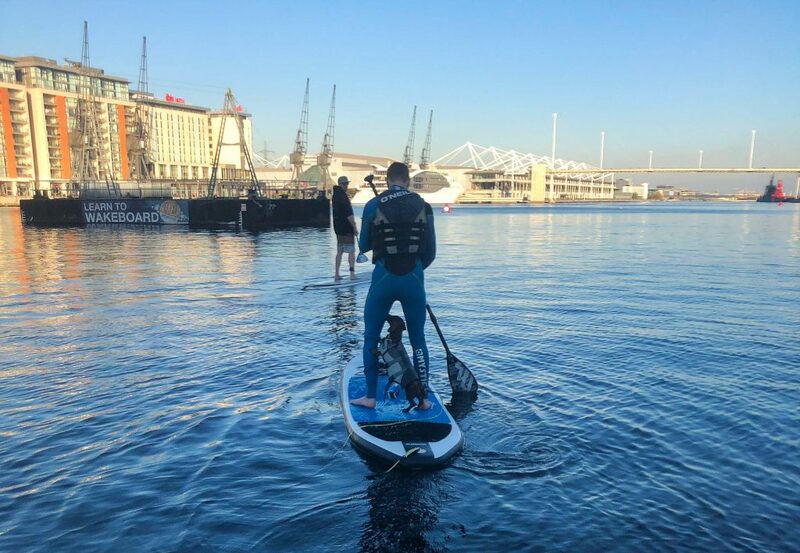 When we saw this “park” during our explorations of the area (in occasion of a dog-friendly trip on the Emirates cable car and evening ou, as we told in our previous post), we were left wondering whether Wakeup Docklands hosted any dog-friendly SUP sessions. 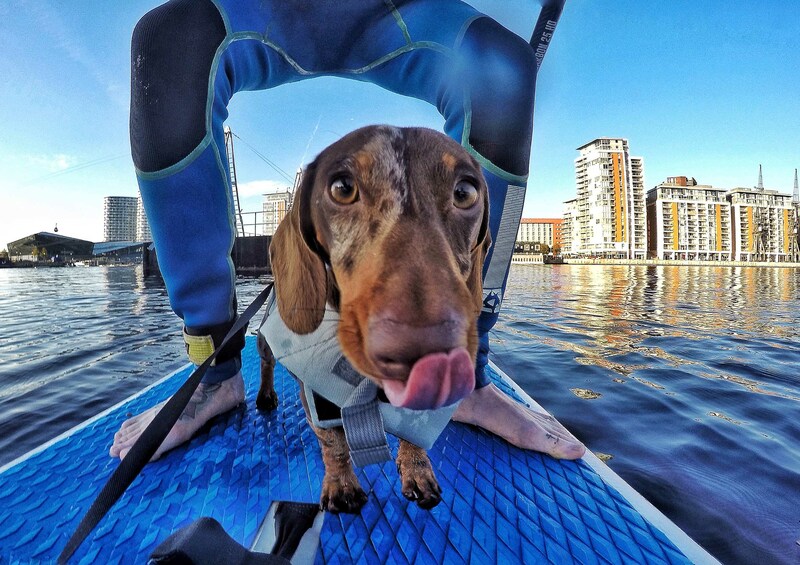 Thanks to George the Miniature Dachshund (on Instagram @southshieldssausage), who tried out the experience before they closed for Winter, we learned that you can indeed enjoy paddle boarding with your dog (at some conditions). As Wakeup Docklands celebrated its reopening on 2nd April after their Winter break, what best time to have George and his humans telling all about their experience and Jon, the founder of Wakeup Docklands, explaining more about their dog policy and all the tips you need for having the most enjoyable adventure. One-year old George, the chocolate dapple miniature dachshund, came to London with his humans Abbie and James from the North of England to enjoy a short vacation, back in Autumn. He is a happy chap, who “loves the beach, in particular digging, and chasing birds! He wasn’t always so sure of the water but since getting him his little lifejacket and taking him out paddling on the coast near our home he’s turned into a bit of a little water baby!”, as Abbie says. They decided to have an alternative experience and bring George to paddle board. “I had previous experience, James hadn’t but was a keen surfer with excellent balance and George was a confident swimmer” says Abbie. She had already got George a lifejacket as they live very close to the coast, and both were keen to get him out on the water with SUP or surf with them when the weather was nice. “Previously he’d been known to jump into ponds and always confidently swam his way out but with us planning trips to the ocean I just wanted to be sure those little legs kept him above big waves! He hadn’t been on SUP before then, that was his first time,” she adds. Jon made sure they were comfortable and competent and the adventure began. Abbie remembers how Jon told them about the area and guided them in the experience giving tips throughout. “We both set off, George was on my board, but he barked for James so we pulled up alongside one another and he jumped ship! Then he would bark for me so we kept swapping with him up the Thames. It was a lovely still day and apart from the odd wakeboarder causing a ripple was a really easy level to start at. He then spent some time chilling on Jon’s board before jumping off and paddling over to us again! He definitely built up his courage as the afternoon went on,” recounts Abbie. “We just loved seeing London from a different perspective and giving George a ‘first experience’. 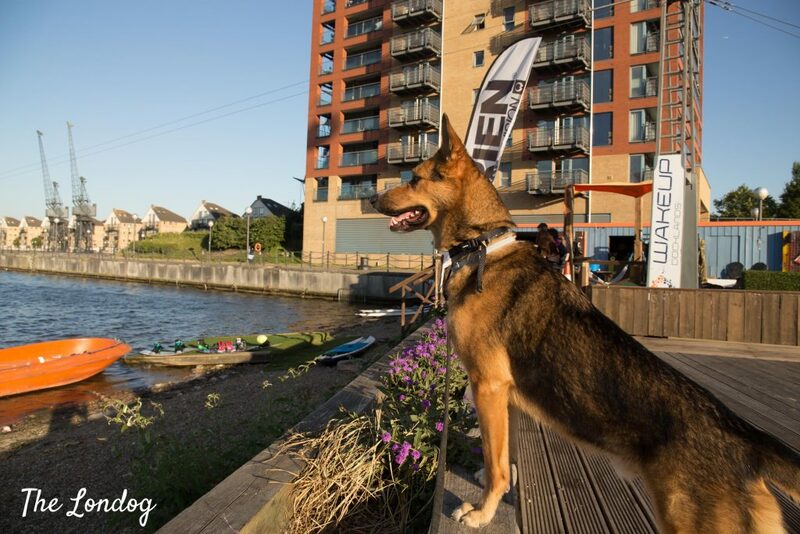 Being from the North, London always seems so fast paced and sometimes not where you’d imagine taking a dog for a day out, but the Docklands was an amazing, a different alternative to the typical London experiences we’d had before,” adds Abbie. 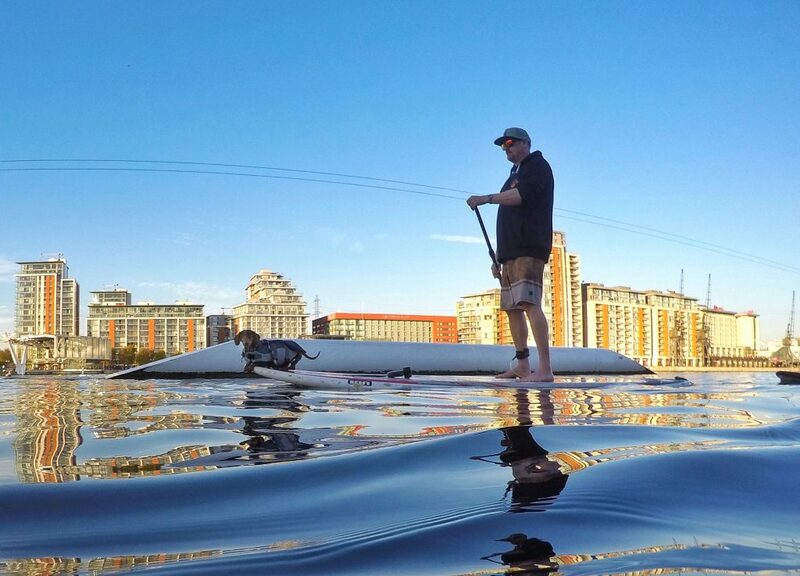 There are a few important things to know about dog paddle boarding at Wakeup Docklands and their policy. We spoke with Jon, the founder. “We have a number of regular customers who hang out at our park with their dogs and like to get out on the water,” said Jon. “Also despite being very dog friendly, we have to exercise a certain amount of caution having too many dogs on site at any one time, as we don’t want to cause any undue stress on any of our customers who may be averse, or in some instances, scared of dogs (especially children).” For this reason they don’t advertise dog paddleboarding as an activity on their website. Chatting with him, he said that if someone has never tried paddle boarding before, it would be best to first book a regular class without their dog (the 1 hour “intro to paddleboarding” or the 2-hour “BSUPA Ready2Ride” class) to gain confidence, as it could otherwise turn into an unpleasant experience for both of them and the dog, and arrage a dog-paddleboarding experience for a later date. In any case, as every situation is different, best to get in touch with Jon and discuss individual circumstances with him. As an experienced certified instructor, he will be able to suggest the best suited solution. Fouling in the dock is strictly forbidden and owners are responsible for their their pets at all times. Dogs must stay on paddleboards. “Obviously we all fall in from time to time, but swimming in the docks is not permitted,” said Jon. Wakeup Docklands does not have any buoyancy aids for dogs, so you will have to bring with your own. Wakeup Docklands recommends that you bring your own dog bowl, especially on hot days. They are happy to provide fresh drinking water for your pets rather them drink the dock water. All paddlers must have prior experience and be able to provide certification of proficiency such as a BSUPA Ready2Ride card, or equivalent for hires. Wakeup Docklands reserves the right to ask people to take their dog home if required, so please respect other customers (especially children) who may be nervous around animals, clean up after your pets and do not allow your dogs to roam unattended off the leash. Also note that beach rules (apart from no swimming) include that no dogs are allowed on the sand. We also asked whether the experience is suitable for any size of dog, to which Jon replied “Within reason. Small dogs are best.” We can imagine that a Great Dane may make it a bit complicated to keep the balance. Water quality: To address concerns about water quality, Wakeup Docklands have a FAQ on their page, which provides “The Royal Victoria Dock is an inlet of the Thames River which has been specifically filtered by a sand bar at London City Airport. The water is some of the cleanest around and the entire Dock is dedicated to leisure, sport and recreation activities with regular safety tests being carried out by the regulatory bodies in the area. 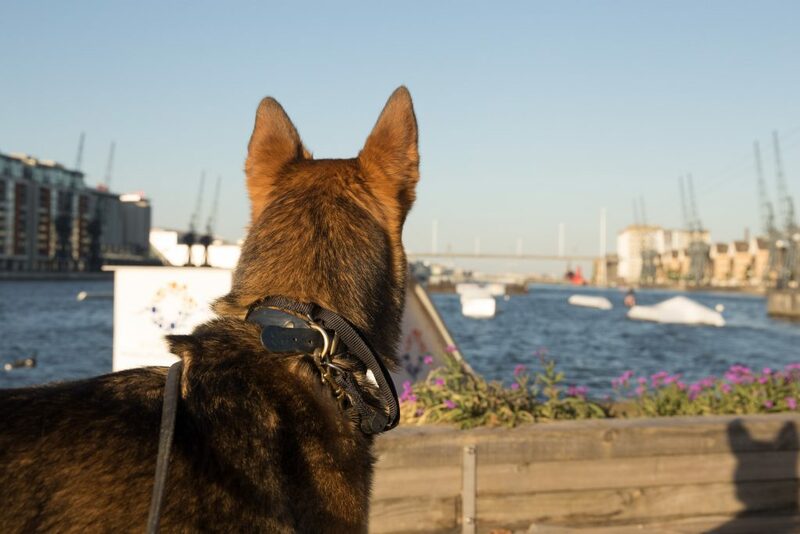 We have a thriving community of wildlife that as gradually been reintroduced to the docklands area and are proud to maintain the area in order for people to enjoy the docks and the watersports we provide.” In any case, better not to drink the water or have your dog drinking it (more FAQs here). Sessions and costs: To book your special dog-friendly session you need to send them an enquiry using the form provided at the bottom of their webpage. As mentioned above, dogs are only allowed on session outside regular classes, which cost £30 per person per hour. They also have wetsuits for hire at £5, which sounds a good idea, especially if it is not too warm. Opening times: Tuesday-Friday 4pm-8pm, Saturday 10am-7pm and Sunday 10am-6pm, and the season runs from April to October. How to get there: Wakeup Docklands can be easily reached with the DLR, getting off at Royal Docks or West Silvertown, depending on which DLR line you get. 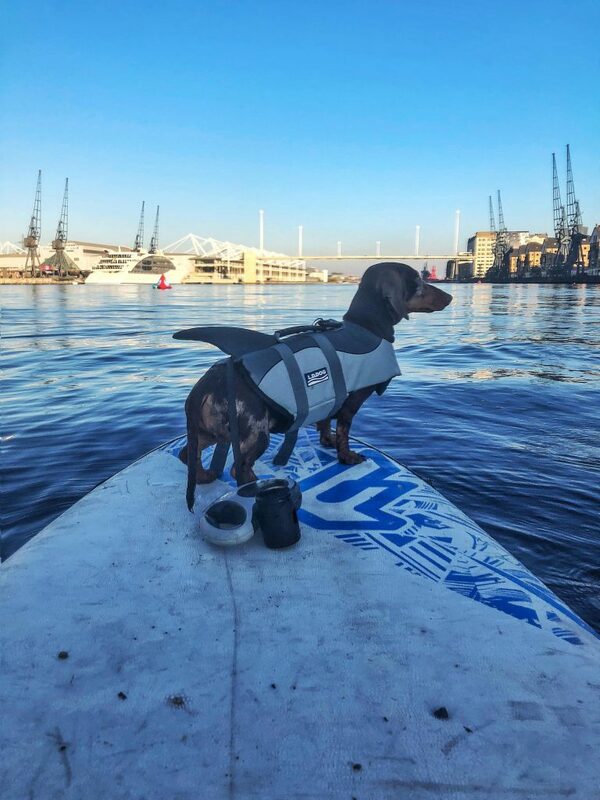 Around the Docklands there are many dog-friendly things to do which you can add to your dog-friendly paddle board experience to make it a dog day out in East London. 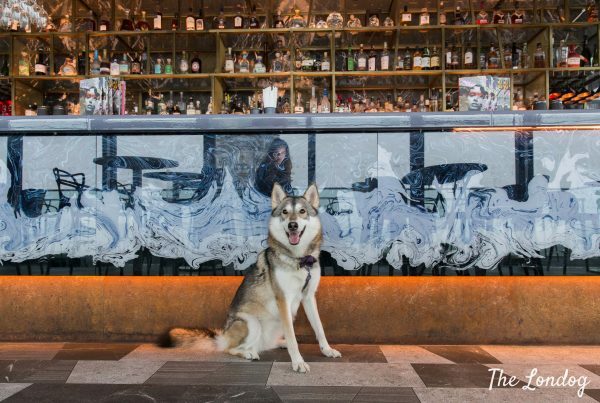 Regarding eateries, cafes and hangouts welcoming dogs, apart from Wakeup Docklands own beach bar, paces away there is the Oiler Bar (which allows dogs and about which we talked about in this post). During their London holiday, Abbie, James and George the sausage stayed at dog-friendly hotel Aloft London, a 10/15minute stroll down the Docklands and found there were loads to see and do: “there were plenty of little cafes and bars that you could sit outside of, we actually stopped on the way back for tea at Heroica Lounge, an open top, red, double decker bus that has been converted into a pizza restaurant! They’re dog friendly on the top deck and the pizza and beers were awesome! 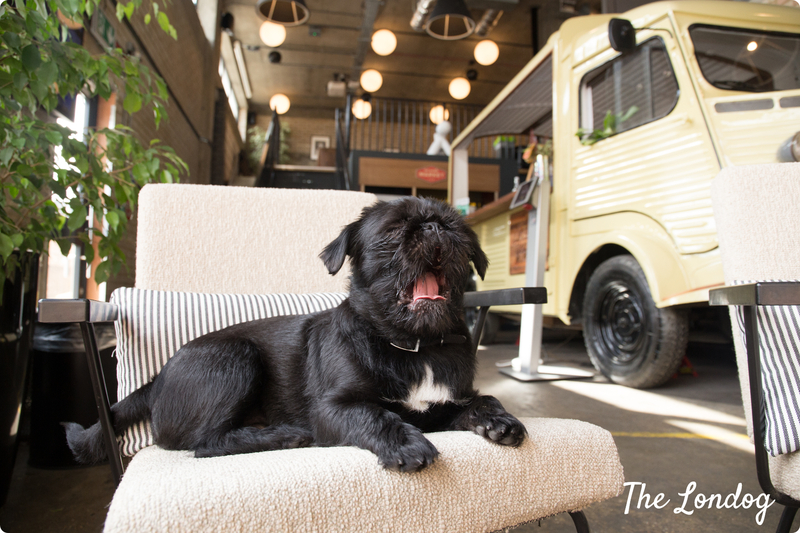 We didn’t get a chance to check out the cable cars but that would definitely be our go to next time!” We will add more other dog-friendly cafes and eateries in the area later. 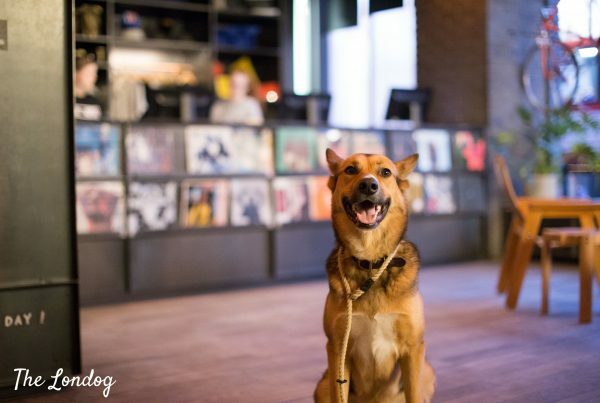 The closest dog-friendly attractions are the Emirates cable car, which you can take to get on the other side of the river and stroll to the Jetty Peninsula for a brunch or dinner at dog-friendly Vagabond, but may be not a great one if your dog is not confident on moving surfaces or with heights. 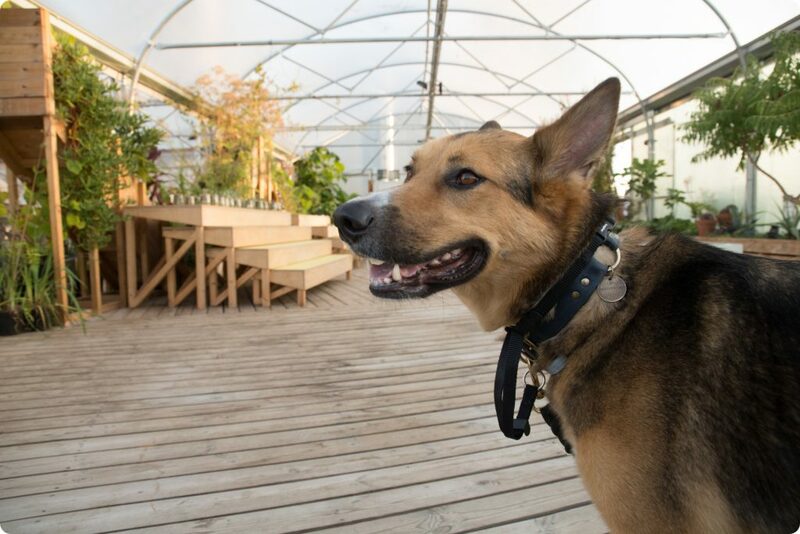 Alternatively, you can head to Trinity Buoy Wharf, which offers a range of activities, including visiting some installations, an old lighthouse, a sculpture park, and has a lovely American diner, where you can sit outside with your dog breaking many possible diet rules. A bit further East, you can reach the Thames Barriers Park, for a nice walk and lovely views of this landmark. If, instead of the area, you are most interested in are other water adventures across London, we previously wrote about hiring a dog-friendly rowing boat in Hollow Ponds, Epping Forest, or in Richmond on the Thames, and going for an electric boat hire on the Regent’s Canal, which may give you some ideas.